How much does it cost to travel to Christchurch? How much money will you need in Christchurch? 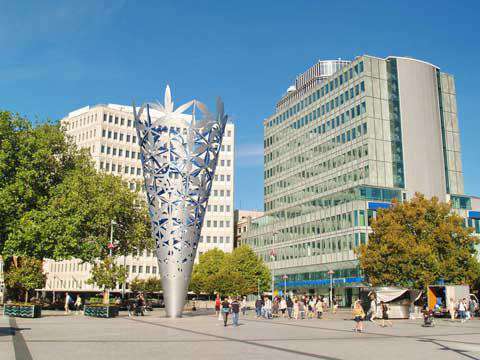 NZ$114 ($76) is the average daily price for traveling in Christchurch. The average price of food for one day is NZ$28 ($19). The average price of a hotel for a couple is NZ$132 ($88). Additional pricing is in the table below. These average travel prices have been collected from other travelers to help you plan your own travel budget. Christchurch is the largest city on the South Island of New Zealand, right beside the Canterbury Plains. Most people begin their South Island travels here. The city itself can be fascinating to explore so it is worth allowing yourself several days in town as an introduction to the region. The River Avon flows through the city center, twisting through the old buildings. Christchurch is referred to in New Zealand as the Garden City and it is easy to see why. It's quite a nice city with trees spread throughout. The economy is centered around international tourism as well as foreign education. There is a high Asian student population here, giving the city a diverse feel. Christchurch's climate is temperate and the city receives moderate rainfall. In January average high temperatures are around 73 degrees Fahrenheit with averages around 52 degrees Fahrenheit in July. There is a sea breeze during the summer months that keep temperatures pleasant. Temperatures can drop below freezing at night during the winter months. Snow may also fall several times a year. There are a variety of places to visit in Christchurch that will help you to orient yourself with the city and the surrounding area. It's great to spend a couple of days in Christchurch at the beginning of your trip so that you can learn about New Zealand and the area's history and geography. The Christchurch Cathedral was originally built between 1864 and 1904 in Cathedral Square. Today's replacement, "Cardboard Cathedral" is located at 234 Hereford Street. Museums worth visiting include the Arts Centre, the Christchurch Art Gallery, the Air Force Museum, Canterbury Museum, and Yaldhurst Museum. Parks in the area include the Botanic Gardens, Ferrymead Heritage Park, Orana Wildlife Park, Willowbank Wildlife Reserve, and Riccarton Bush. Many people prefer to stay in Christchurch's inner city, specifically the area bounded by Deans, Bealey, Moorehouse, and Fitzgerald Avenues. From there you can walk to many places. Hagley Park and the Botanic Gardens are technically still in the inner city to the west of the central business district. This area also has great accommodations and interesting sights. Fendalton is a beautiful neighborhood with old homes and tree lined streets. The suburb of Merivale has high end shopping and a number of bed and breakfasts. St. Albans is to the east and has a some number of hotels and very little shopping. To the west of Hagley Park is Riccarton. This is a center for shopping and entertainment. There's a large shopping mall and many cheap Asian restaurants. It's also where you'll find Canterbury University. Sumner is about half an hour from the city and has great views of the city and coast. It's a nice holiday spot for locals and popular with surfers during the summer months. Lyttelton is a quaint port village about half an hour from town. There are some interesting activities that you can enjoy while you're in Christchurch. Driving or biking along the Summit Road offers great views of the city, the Southern Alps, Pegasus Bay, Lyttelton Harbour, and Banks Peninsula. It's also worth visiting Lyttelton Farmers Market. The market is open every Saturday morning between 10:00 am and 1:00 pm. If you find yourself in Christchurch at the right time, you can see one of its many festivals. Summer begins in December and runs into February. It offers some great free events with music and art. The World Buskers Festival is in January and features comedy and circus activities. Another fun one is the Christchurch Garden Festival which is in March. There's a diversity of food options in Christchurch. If you're on a particularly tight budget you can pick up some groceries at a supermarket and prepare your own meal. Fish and chips are also a common and cheap meal. Asian food is quite common as well, particularly in the Riccarton and Upper Riccarton areas. Church Corner is considered the city's unofficial "Chinatown" and has many Asian supermarkets and restaurants. Korean restaurants are also quite common. Public transportation in the city is generally lacking, however the bus system has improved in recent years. It is recommended that you have a car if you plan to spend any significant amount of time in Christchurch. Alternatively, the city is quite flat so it is easy to navigate with a bicycle. This is a cheaper alternative if you aren't able to rent a car and are looking to save some money. Whether on bike or in a car, it is relatively easy to navigate the city as it is laid out in a grid.